Perfectly true. There are stages for love relationships to fade. You describe the first stage where anger and confusion are intermingled. Everybody suffered this. 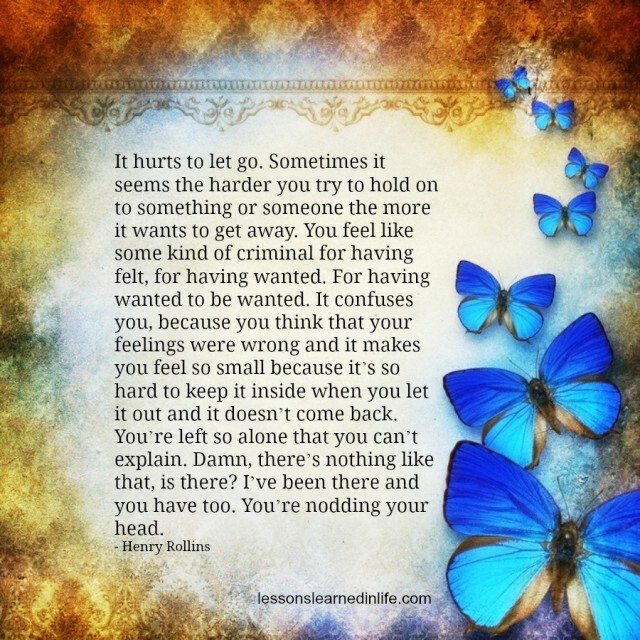 It really hurts to let go…. Especially if you know in your heart that you are not ready……..still trying your best to save the relationship…..but must let go…. As the saying goes….. If you love him/her….set them free……if he/she comes back….she/he is your forever…. I’m going through that right now. For each moment I think I’m fine, there are 5 other moments that prove me wrong. I realize that once you’ve taken down your wall & let someone into your soul, it’s hard when they decide that’s not the place for them. You’re left with a crumbled wall, a soul w/ a huge hole, & the fear of never being able to heal again. There’s always a little voice inside that tells you it’ll get better, but believing that voice is a challenge. It Will Get Better for me & for you too. You said it just right! Yes. I have had xperiences, in both, animals & people. And to tell the people around you what is really going in your head.., that is not easy because he is away and he will not come back. 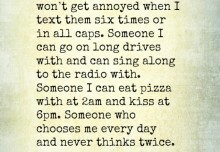 And to be honest I do not want him to do that he let me go, he can life without me so I dont deserve that. This really hit home today. Much needed and much appreciated. 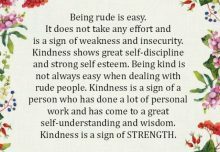 True, this is what im goin through right now n it wasnt easy as I thought n to make it worse we in the same workplace and I had no choice but force to give up the job which I like and now im feeling lost in my direction in my career and at the same time trying my best to heal. It was tough n difficult..
For me it is the other way around (a friendship). I was not feeling great when I was with the other person. At some points yes it was great but for me she was too demanding an was askings too much attention in a way I didn’t like. I stepped over my own boundries and that was not good. I understand that for her it is difficult to let go. For me it is difficult too, but i’m more steps ahead (think, set boundries, act on it and letting go) and she is just at the beginning of understanding what is happening. She will find her way. Remember how valuable YOU are and do not make yourself available to someone who only considers you an option. 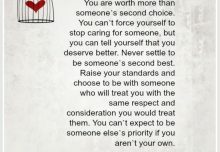 You are worth more than that and deserve someone whom you do not have to “work” to keep. If they are the one for you and YOU are the one for them, they will stay or reenter your life at a different time. Never beg someone to come back…do not lower yourself, YOU deserve more and someone who wants you enough not to leave nor have to be convinced to stay. Remember, a soul mate is a two way street, not one who thinks they are and one who is clueless. You can not make someone feel something just because you do. Let them go and move on….your soul mate is out there. Denise, your words are so true! Been dealing with this for months, We are both 51 but,it’s hurt the same as at 18. He started to pull away and I tried so hard. I made mistakes and he did too. But I stayed kind and loved him. He got critical and distant but still around. I knew it was not right. Besides some things I did not favor I knew he didn’t want me anymore. But putting all his rudeness and hurtfulness aside I still wanted him. So dumb. But I still desire to have the good times back and be together. It won’t ever be but I cry a lot and I know he has moved on and searching out new girls. That really hurts. I feel so rejected. I long for the day that this hurts no longer. When will that be? I’ve read all your comments and I know I will get through this ,it at the moment I’m too raw , I lived on the other side of the world with my partner for the last 2years , he went out to work building gas tanks , all of a sudden he seem to forget about me , from calling morning and night , to one text a week, I felt he didn’t want me anymore so I finished it with him, and I came home , that was 6 weeks ago , he’s sent me an odd text asking me if I’m ok , I’m absolutely heartbroken , we are both 54 spent the last 2years spending all our spare time together , done everything together , I can’t stop the tears ,would love to know what happened as I’m in limbo , I absolutely adored him . I’m so sorry for the pain you are experiencing. Consistency is so important in a relationship and when you don’t have that, you’re left waiting and wondering, which isn’t fair to you. I pray that your heart will heal and that you will have the love you so richly deserve. Yes I also can relate to all the comments made. I also is going though the same thing. But I have excepted that he did not want to be with me. So I am moving on we are friends. But I keep my distance I don’t call him nor txt him. I let him call me or txt me frist. Then I may call him. Then I pray every nite that God remove the way I feel about from my heart. Because it stills hurt yes it hurts. I didn’t think so many people was going though the same thing. Time time time the only healer though not the perfect or fastest. I have very little control on my feelings but time is the only remedy though difficult and protracted remedy. So much true.. Im glad im not alone experiencing this sorrow right now alot of people can relate to this.. Its not easy so many sleepless night it hurt the most especially you think that you try so hard to save the relationship.. But it failed..
Hello again every one , as the time goes on , I’m starting to feel a little bit better , I’ve stopped crying , as my mum said God will give you something bigger to cry about , then I realised he’s not worth it, my immediate family are more important to me , especially my little grand children , their my life . I’m still very hurt as to how I was treated and left on the other side of the world without any explanation. At least I’ve mad my away home now and I’m with my family , I feel safe again . I’m currently going through this.. I’ve been with my partner for 8 years and we are ment to be getting married next year, the wedding is all booked and paid for and guest have booked their flights.. My life is hanging in the balance.. I feel like my heart has been ripped out.. I don’t understand why or what has happend.. If he really loved me I wouldn’t put me through this.. My whole world has been tipped upside down .. I won’t beg for him to stay and I won’t ever forgive him.. But it sure is hard to let it go. Life is sent try us and try us it does. It has been 16 months. Some days are better then others, then, some days, even thou rarely, everywhere I look, I see you. I learned to be happy. Every day I made an effort to put one foot I front of the other. In my mind I knew, you did not deserve me. I knew I was lucky that you left. Still, my heart ached with such intensity, it took my breath away. Tears would flow like an endless river, whithout warning. I would scream in the mirror , I would hate myself for being so weak. But every passing day … I would get a little bit stronger. Slowly, I began to heal. I start enjoying life, my friends, my work. Went back to school, and I can truly say, I am happy. I found myself – did not realized that through the process of trying to hold onto you – I lost myself. Never enjoyed freedom and solitude more then I enjoy it today. I am happy, happier then I have been in a very long time. Sometimes, you still comes to my mind, like a ghosts, you sneaks up on me. Your shadow resting for a moment on my heart… then I get this feeling of deep sadness, and I know, it’s time to hush you away !! Go, go away. I’m free from your cruelty. I’m free from you. You can’t hurt me anymore. You have no power over me anymore. I’m free, like a bird, I am strong. I opened my wings you tried to cut off, and I am flying !! The wind in my hair, smile on my face … you can’t touch me anymore. I loved you, with all my heart, mind and soul. I loved you more then I ever thought it’s possible to love someone…. I trusted you with everything I had … I loved you relentlessly for 6 years . I loved you TT … But now, You bring sadness in my heart when I think of you. I feel sorrow for you, sadness and pitty … but I don’t have love left for you anymore … So, goodbye … Be well. I am free from you. I’m happy. 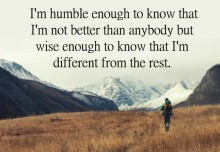 This is so true, i am going through this right now in my life. Sometimes you feel like your fighting a loosing battle. It hurts so bad you just have to be strong.